Google already has your land travel covered, from Google Earth to street views to building plans (see our post on Indoor Maps), but now they want to take you underwater to Australia’s Great Barrier Reef, with the help of the University of Queensland, Catlin Group Limited, and some pretty fancy cameras. For the project, the Catlin Seaview Survey will photograph 360 degree underwater panorama views of shallow reefs, which over the next few years will be made available to the public through Google Maps, Google Earth, and even live YouTube streams on a dedicated YouTube channel. You can see a demo of the Street-View-inspired Seaview maps here. These gorgeous images and maps are made possible by a specially designed camera called the SVII, which acts as an underwater scooter and takes photographs as it moves. The photographs will be analyzed by image recognition software that will quickly catalog the wildlife at the 20 sites chosen for study along the Great Barrier Reef. But there are other components to the project, as well: a deep reef survey, and a mega fauna survey. The deep reef survey, using diving robots and HD cameras, aims to document the little-known deep reefs (30-100 meters underwater) and their biodiversity and health. The mega-fauna survey, which is led by Emmy award-winning cinematographer and shark researcher Richard Fitzpatrick, will track 50 animals (tiger sharks, green turtles, and manta rays) by satellite tags, which will record the position, depth, and temperature of the animals’ locations. Many of the sites surveyed are difficult to reach, but thanks to Seaview, you can explore them from the comfort of home. (You could also check out our post on 3rd Planet, another way to armchair travel.) 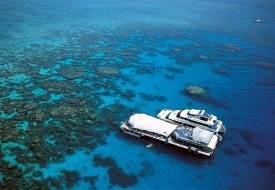 Of course, there are some areas of the Great Barrier Reef you can and should see in person. Be sure to check out our Great Barrier Reef destination guide for more information on where to stay, when to go, and where to dive.